So, today I went in search of a leaf with a little more color. Maybe it’s too late, I didn’t find many maple leafs in my front yard with much color left, so I resorted to one that had at least a little bit of green left. Sketching this one was difficult because the leaf was curling up fairly quickly as I tried to sketch. I had to erase my first attempt and redo it because the leaf changed so much from when I started to when I was done. After sketching, I again started with the shadow, this time in Payne’s gray. Then I put a pretty bold amount of Phthalo Blue and Hansa Yellow to make a green in the heart of the leaf. I blended that with some New Gamboge and Quin Gold around the edges, and used Phthalo Blue+Burnt Sienna for the grey on the exposed undersides. I’ll post a photo of the leaf after the first wash, so I remember how those bold bright colors desaturate as they dry, and as I glaze over them. Then, I started layering thin glazes of yellows, oranges, greens and browns (Ruff!) softening the edges as I went. I used Bloodstone again for the crisp edges, it seems to be just the right pigment for that. After surrendering, I let it dry, and then glazed in some shadows and more Quin Gold on the leaf to try to make it feel less flat. I finished with another pass on the shadows, and tried to soften the edges a bit. I went overboard softening those edges, giving the impression of an additional light source. I guess that’s ok though, because I do have three different light sources shining on the paper when I’m painting. (I set up shop on the edge of the kitchen, so I have the kitchen ceiling light behind me, can lights in the ceiling above me, and a light from a ceiling fan in front of me. If I ever build the painting desk I want, I’ll need to make sure I leave room for a lamp! 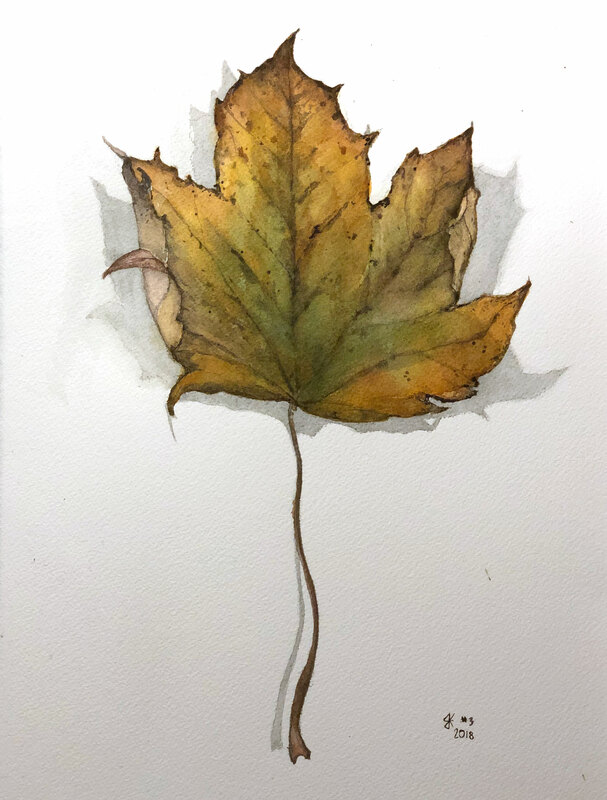 Halfway through painting this, I mulched the leaves in my yard, so this might be the last leaf for now.